Applied Engineering Analysis is a concise textbookwhich demonstrates how toapply mathematics to solve engineering problems. It begins with an overview of engineering analysis and an introduction to mathematical modeling, followed by vector calculus, matrices and linear algebra, and applications of first and second order differential equations. Fourier series and Laplace transform are also covered, along with partial differential equations, numerical solutions to nonlinear and differential equations and an introduction to finite element analysis. The book also covers statistics with applications to design and statistical process controls. Drawing on the author's extensive industry and teaching experience, spanning 40 years, the book takes a pedagogical approach and includes examples, case studies and end of chapter problems. It is also accompanied by a website hosting a solutions manual and PowerPoint slides for instructors. Strong emphasis on deriving equations, not just solving given equations, for the solution of engineering problems. Examples and problems of a practical nature with illustrations to enhance student’s self-learning. Numerical methods and techniques, including finite element analysis. Includes coverage of statistical methods for probabilistic design analysis of structures and statistical process control (SPC). 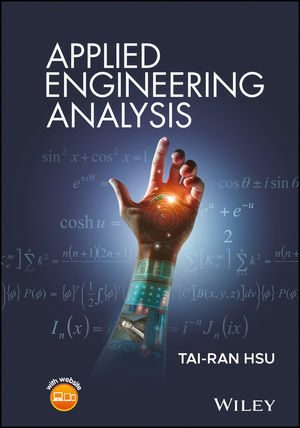 Applied Engineering Analysis is a resource book for engineering students and professionals to learn how to apply the mathematics experience and skills that they have already acquired to their engineering profession for innovation, problem solving, and decision making. TAI-RAN HSU is currently a Professor of Mechanical Engineering at San Jose State University (SJSU), San Jose, California, USA. He joined the SJSU as the Chair of the department in 1990 and served two terms until 1998, and also from 2012 to 2015. He served in a similar capacity at the University of Manitoba, Winnipeg, Canada before joining SJSU. Prior to his academic career, he worked as a design engineer with heat exchangers, steam power plant equipment, large steam turbines, and nuclear reactor fuel systems for major industries in Canada and U.S.A. He has published six books and edited another two on a wide ranging topics on finite element method in thermomechanics, microelectronics packaging, CAD, and MEMS and microsystems design and packaging. Additionally, he published over one hundred technical papers in archive journals and conference proceedings.